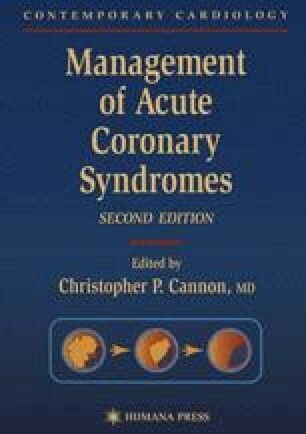 At the beginning of the 21st century, cardiovascular (CV) disease remains the leading cause of death (1). Over 12,400,000 Americans are living with clinical coronary heart disease (CHD), and this year, an estimated 1,100,000 Americans will have a fatal or nonfatal acute myocardial infarction (AMI). CV disease was responsible for 950,000 deaths in the United States in 1998, accounting for over 40% of all deaths, and CHD was the leading cause of cardiovascular death, claiming 460,000 lives. Half of CHD deaths (a quarter million/yr) are directly related to AMI. Death occurs suddenly, out-of-hospital, in 220,000 annually, and most of these deaths are triggered by coronary ischemia (2–4). Indeed, at least one-half of AMI-related deaths occur within 1 h of onset of symptoms and before reaching a hospital emergency department (5). Although CV mortality rates declined between 1980 and 1992 in men, they increased over the same period in women, and for the past 10 yr, they have failed to decline or have increased in men as well (1). Thus, the impact of CV disease, and AMI specifically, continues to be great.